Ohnoya was established in the 1770s and moved to its present location in Shintomi-cho in 1849. For generation after generation we have made and sold “tabi”-the slipper-like socks for use with the kimono. 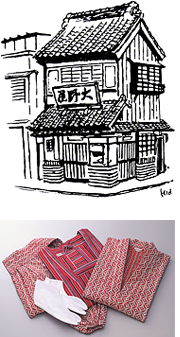 The names “Ohnoya” and “Shintomi-style tabi” became widely known with the creation of the Shintomi-za and Kabuki-za theaters. Our tabi with their narrow soles and slightly upturned toes make the foot appear thinner and lovelier, and our custom-fitted, hand-sewn tabi are still a great favorite with top Kabuki actors, geisha and other stage performers. Besides our special order tabi, we also stock a large selection of tabi in all different sizes and widths so customers may be assured of finding a perfect fit. In addition to tabi we also make and sell undergarments for use with the kimono, nightgowns, pajamas, handkerchiefs, bathrobes and a wide range of other kimono accessories in our own original patterns and colors.